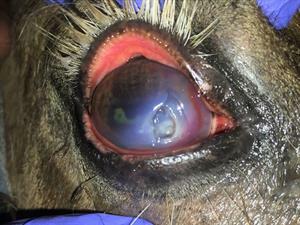 Corneal ulceration is a very common injury in horses which can easily be sight threatening. Ulcers can vary widely in their size and extent with deep and melting ulcers being a medical emergency that can progress rapidly to corneal perforation. Outcome will depend on and can be greatly improved by early diagnosis followed by appropriate medical and/or surgical treatment. Horses should be checked on regularly for signs of ocular pain. Excessive tearing and squinting are the most common clinical signs with cloudiness at the ulcer site sometimes visible. Any signs of eye pain or a history of trauma to an eye should warrant a full veterinary examination. Diagnosing an ulcer is simple and is easily performed by your veterinarian. 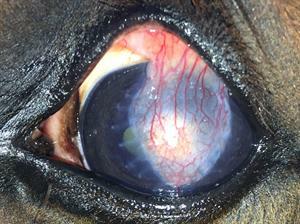 In addition to a full ophthalmic examination, your vet will stain the eye with fluorescein dye. This dye will adhere to the cornea on areas where the first layer (epithelium) is not intact. This will be seen as a bright apple green stain. In a normal horse, the fluorescein stain will not stick to the eye as the epithelium is intact. Deeper ulcers are identified visually and may be negative on fluorescein staining. Image: Horse with corneal ulceration in the eye before staining. 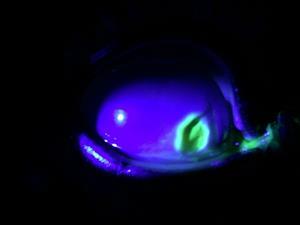 Image: After staining the eye with fluorescein. In addition to staining, your veterinarian may take samples for culture and cytology to identify if any organisms are involved and if so the type of organisms involved. Both culture and cytology are useful tools and may assist in deciding the type, frequency and duration of medications required. Depending on the size and extent of the ulcer your vet will recommend either medical or surgical management. In addition to this, corneal ulcers are very painful and will require appropriate pain relief usually in the form of phenylbutazone or flunixin meglumine. Medical management may include topical antibiotics, antifungals, anti-proteinases and atropine. The frequency will depend on the ulcer but can be anywhere from twice a day to more intensive cases with hourly medications. Intensive cases commonly require hospitalisation as well as placement of a sub-palpebral lavage system (SPL). An SPL system is a thin piece of tubing that is placed in the eyelid and extends to the withers allowing medications to be administered safely and directly into the eye from a distance. Once correctly placed and well maintained, they can remain in place from weeks to months. Surgical management is mainly in the form of a conjunctival graft and this is recommended when the ulcer is large or rapidly progressing. This procedure requires a general anaesthetic and involves grafting conjunctiva to the cornea to provide a rich blood supply. Image: A horse three days after conjunctival graft surgery with the graft in place. The other option is to have the eye removed (enucleated) either due to the extent of the injury or financial limitations. This is a quick procedure which can be performed in a standing horse. Horses adapt exceptionally well with one eye and can continue to have an excellent quality of life however this can be career ending due to racing rules. Corneal ulcers can vary hugely in their presentations and can take a long time to heal. With both medical and surgical treatments having their own set of complications, early diagnosis and appropriate treatment is crucial in maximising the chances of maintaining the eye and vision.